When it comes to restaurants serving pure Indian vegetarian food, Chicago and its suburbs offer rich choice. There are several Indian restaurants in Chicago catering exclusively to Indians who do not prefer to dine at places serving both vegetarian and non-vegetarian food. Devon Ave in Chicago, SVS Temple Canteen in Aurora, Rama Temple Canteen in Lemont are some of the popular destinations for Indian vegetarian food. While most Chicago Indian vegetarian restaurants offer thalis and a la carte menu, there are a few that offer vegan and vegetarian lunch and dinner buffets as well. 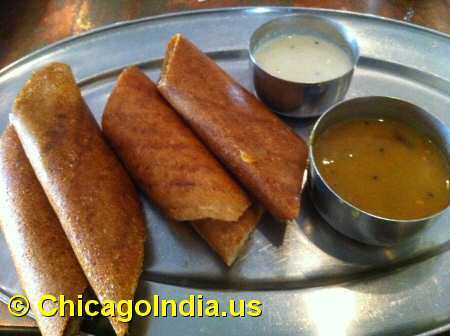 Masala Dosa, Tamarind Rice, Curd Rice, Idly, Vada, Pongal, Chole Bhatura, Vegetable Cutlet, Paratha, Baingan Bhartha, Mysore Coffe, you get them all and more at these vegetarian heavens in Chicago. Vegan & Vegetarian Thali etc. Dosa, Vegetarian Thali, Coffee, Vegetable Biryani etc.